Offering you a complete choice of products which include salwar suit, pure cotton salwar material, grand style salwar kameez, semi stitch salwar suits, traditional patiyala salwar suit and zari border anarkali salwar suits. Honored to the presence of our amazing tailors, we have been able to manufacture, trade, export and supply a gorgeous collection of Salwar Suit. 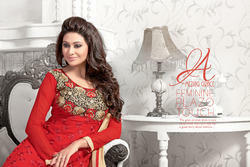 Our offered salwar suit is widely demanded among ladies for its atheistic appeal & comfort fabric quality. It is stitched & designed from the soft & finest fabric, our suit add gleam to the wearer’s personality and enhance their appearance. Its amazing embroidery work makes our suit more attractive & different from others. We are giving this suit at the reasonable rates. We are the Leading Supplier, Trader, Exporter and Wholesaler of Pure Cotton Salwar Material in Chennai, Tamilnadu, India. We are the Leading Supplier,Trader,Exporter and Wholesaler of Grand Style Salwar Kameez in Chennai,Tamilnadu,India. We are the Leading Supplier,Trader,Exporter and Wholesaler of Traditional Patiyala Salwar Suitin Chennai,Tamilnadu,India. 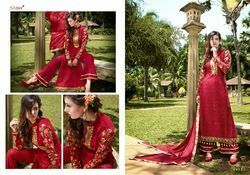 We are the Leading Supplier,Trader,Exporter and Wholesaler of Zari Border Anarkali Salwar Suits in Chennai,Tamilnadu,India.